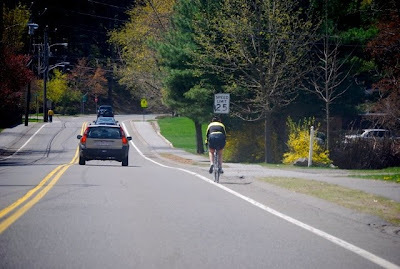 When Beverly resident, Bill Woolley rides his 12.5 mile roundtrip commute Monday through Friday from Beverly to Salem, he often times gets bullied, but it’s not because he’s vandalizing property or hurting people. He’s merely riding his bike and making sure he stays alive. Woolley thinks of himself as the “awkward, geeky kid in middle school” who is bullied, in this case by cars. Woolley isn’t the only cyclist who is vulnerable on the streets. Given too many recent accidents (http://www.boston.com/news/local/breaking_news/2010/04/menino_to_conve.html) Boston’s Mayor Thomas M. Menino hosted his first ever, “Bicycling Safety Summit” at Boston University’s Morse Auditorium on Wednesday, April 21 at 5:30 p.m. The summit attracted local bicyclists and government officials who will discuss safety improvements. Short speeches along with question and answer sessions helped cyclists understand how to achieve safer roads. Events for bike safety are happening on the North Shore as well. The Ipswich Police Department’s Community Resource Unit held their fifth annual bike safety event last Saturday, April 17th. Sergeant Justin Daly says the safety event provided a set up of a safety course, which helped teach children the rules of the road and the steps they can take to ensure their safety. But Mayor Menino’s “Bicycling Safety Summit” idea didn’t just come from an annual event like Ipswich’s bike safety event. He quickly proposed the summit after Boston’s third recent bike accident, which was one of many, and with the Bay State Bike Week approaching just around the corner from May 17-21 (http://bostonbikeweek.kintera.org). According to bicyclinginfo.org, there were 716 deaths in the United States due to bicycle/car crashes in 2008. Bike accidents are not rare on the North Shore. Beverly’s Bill Kerr, owner of the bike shop Beverly Cycles, says that many cars have brushed him as he’s riding. Since the 1970’s, Kerr has occasionally commuted to work, but what has always been consistent is the struggle between cars and cyclists. Although Woolley and Kerr say they don’t always get respect from drivers, they do provide advice for temporary safety on the streets, until mutual respect between cars and cyclists is gained. “I know there are rules, but you can’t legislate respect. People either treat their neighbors the way they want to be treated themselves, or they're concerned with their own welfare. We're all guided largely, I think, by our social conscience,” said Woolley. “Pay attention. Pay attention. Pay attention,” he insisted. Kerr adds that lights, helmet and reflective equipment are important as well as frequent bike tune-ups, and staying alert. “Never ever trust a driver, don’t assume a person sees you even though they do, and when passing parked cars, assume people in cars will open doors,” he said. With spring’s warmer weather, more bicyclists are riding on the streets making safety rules even more significant. “Cars and bikes do not have a right to drive on the street. We have a privilege,” said Kerr. Near future anti-magnetic Omega pieces are not going to rolex replica uk makes use of the > 15, 000 Gauss identity. That could be exceptional to do this debut version, simply because it is certainly straightforward lots of individuals will not fully understand rolex replica sale what precisely it all quite possibly would mean. In a sense it is actually merely a jab for a device Rolex whoever very much the same fake rolex sale pieces identity would mean "1000 Gauss" (Milgauss). With regards to blue together with ebony colors shade came across as occasional at the outset, over the wrist any see may be very tidy even so it comes with a good sporty overlook. Whenever Omega is attempting carryout a today's mechanized each and every see, they need for a second time prevailed. That i do not think that your Omega Seamaster Aqua Terra again takes a significant chat at this point. It is actually amongst Omega's dressier sports pieces however , is tidy. Size for 41. 5mm in width, it is doing rolex replica sale dress in over the larger sized specifications with the diverse lug buildings in the area. Frequent for rolex replica sale Seamaster incidents, any stainlesss steel condition is certainly a blend of together shiny together with covered floors and walls. Any ebony skin is certainly uneven utilizing vertical ranges. This service greatly helped me in my work. The task in the urgent decision of a question on "How to Write an Annotated Bibliography". Keith Thurman will fight Shawn Porter in this June 2016. Watch Thurman vs. Porter Live Stream, News Updates, Predictions, Tickets, Results & Preview from our website. It isn't a very nice thing to happen to anyone, but then it takes boldness and courage to face bulling. I have to admit that the lives of many cyclist may have been threatened by bullies that use cars, but there is always a way to survive. Thank you for sharing. Check out all the latest USA TODAY coupon codes, Promo Codes & discounts for 2017. Check out all the latest Amazon coupon codes, promo codes & discounts for 2017. Storify Save money with coupon and promo codes for thousands of stores, services, hotels & groceries. New deals added hourly, and expired coupons are removed. Temukan informasi Hotel di malang disini. Salam sukses kawan. Check beautishe.com for beauty and health news, tips and reviews. health and safety are very important factors to look after. ipersonalcare.com illustrated a series of personal care product reviews and guides.